In this tutorial, I will explain how to develop an OSGi component for OpenDaylight that is implementing custom network control logic. In contrast to the REST interface, which I have explained in one of my last posts, OSGi components can receive packet-in events, which are triggered when a packet without matching flow table entry arrives at a switch. Therefore, in order to do reactive flow programming, OSGi components are the right way to go in OpenDaylight. Even for experienced Java programmers, the learning curve for developing OSGi components for OpenDaylight is quite steep. OpenDaylight uses powerful development tools and techniques like Maven and OSGi. Moreover, the project structure is quite complex and the number of Java classes overwhelming at first. However, as you will see in this tutorial, the development process is quite straightforward and thanks to Maven very convenient. How to setup an OpenDaylight Maven project? How to install, uninstall, start, and stop an OSGi bundle in OpenDaylight at runtime? How to manage the OSGi component dependencies and life-cycle? How to receive packet-in events through data packet listeners? I should note here, that I will use the so-called API-driven Service Abstraction Layer (SAL) of OpenDaylight. OpenDaylight implements a second alternative API called the Model-driven SAL. This API I might cover in a future post. The figure below shows the architecture of our system. It consists of a number of OSGi bundles that bundle together Java classes, resources, and a manifest file. One of these bundles called the MyControlApp bundle is the bundle we are developing in this tutorial. Other bundles are coming from the OpenDaylight project like the SAL (Service Abstraction Layer) bundle. 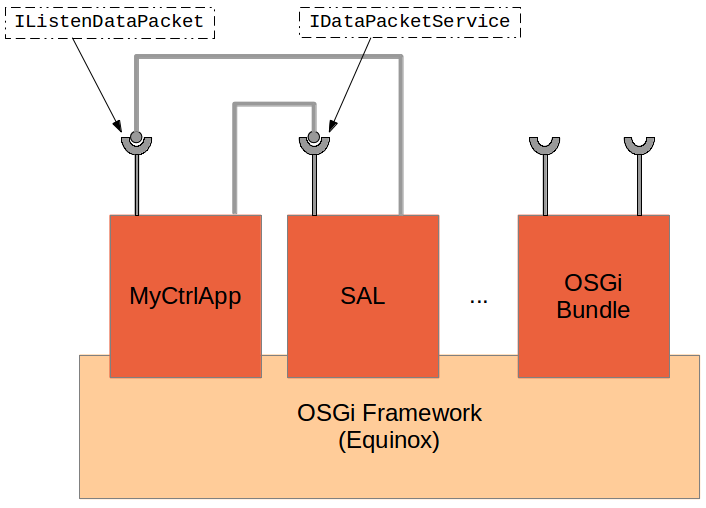 Bundles are executed atop the OSGi Framework (Equinox in OpenDaylight). The interesting thing about OSGi is that bundles can be installed and removed at runtime, so you do not have to stop the SDN controller to add or modify control logic. As you can also see, OSGi bundles are offering services that can be called by other OSGi components. One interesting service that comes with OpenDaylight and that we will use during this tutorial is the Data Packet Service (interface IDataPacketService) to decode data packets. Although our simple control component is not offering functionality to any other bundle, it is important to understand that in order to receive packet-in events, it has to offer a service implementing the IListenDataPacket interface. Whenever an OpenFlow packet-in event arrives at the controller, the SAL invokes the components that implement the IListenDataPacket interface, among them our bundle. Before we start developing our component, we should get a running copy of OpenDaylight. Lately, the first release version of OpenDaylight was released. You can get a copy from this URL. Actually, in order to develop an OpenDaylight OSGi component, you do not need the OpenDaylight source code! As we will see below, we can just import the required components as JARs from the OpenDaylight repository. For instance, you see that Maven has downloaded the Apache Xerces XML parser. We will come back to this nice feature later when we discuss our project dependencies. I will refer to the root directory of the controller as ~/controller in the following. Obviously, Java implementations go into the folder src/main/java. I used the package de.frank_durr.myctrlapp for the implementation of my control component. First, we define our group id (unique id of our organization) and artifact id (name of our component/project) as well as a version number. The packaging element specifies that an OSGi bundle (JAR file with classes, resources, and manifest file) should be built. During the Maven build process, plugins are invoked. One very important plugin here is the Bundle plugin from the Apache Felix project that creates our OSGi bundle. The import element specifies every package that should be imported by the bundle. The wildcard * imports “everything referred to by the bundle content, but not contained in the bundle” [Apache Felix], which is reasonable and much less cumbersome than specifying the imports explicitly. Moreover, we export every implementation from our package. The bundle activator is called during the life-cycle of our bundle when it is started or stopped. Below I show how it is used to register for services used by our component and how to export the interface of our component. The dependency element specifies other packages to which our component has a dependency. Remember when I said that Maven will download required libraries (JARs) automatically to your local repository in ~/.m2? Of course, it can only do that if you tell Maven what you need. 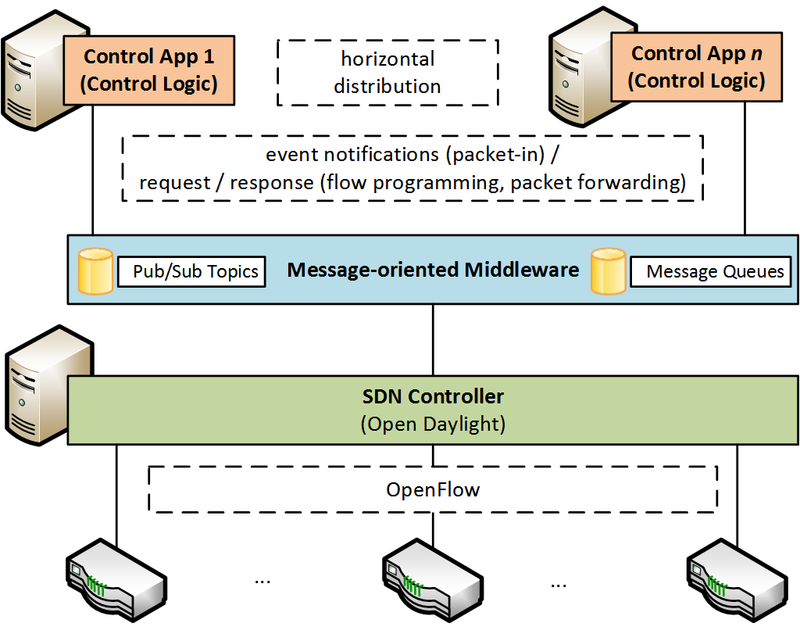 We basically need the API-driven Service Abstraction Layer (SAL) of OpenDaylight. The OpenDaylight project provides an own repository with the readily-compiled components (see repositories element). Thus, Maven will download the JARs from this remote repository. No need to import all the source code of OpenDaylight into Eclipse! In my example, I use the release version 0.7.0. You can also use a snapshot by changing the version to 0.7.0-SNAPSHOT (or whatever version is available in the snapshot repository; just browse the repository URL given above to find out). If you need further packages, have a look at the central Maven repository. Remember to re-create the Eclipse project using this command, when you make changes to the POM. In order to implement our OSGi component, we only need two class files: an OSGi activator registering our component with the OSGi framework and a packet handler implementing the control logic and executing actions whenever a packet-in event is received. We extend the base class ComponentActivatorAbstractBase from the OpenDaylight controller. Developers already familiar with OSGi know that there are two methods start() and stop() that are called by the OSGi framework when the bundle is started or stopped, respectively. These two methods are overridden in the class ComponentActivatorAbstractBase to mange the life-cycle of an OpenDaylight component. From there, the two methods getImplementations() and configureInstance() are called. The method getImplementations() returns the classes implementing components of this bundle. A bundle can implement more than one component, for instance, a packet handler for ARP requests and one for IP packets. However, our bundle just implements one component: the one reacting to packet-in events, which is implemented by our PacketHandler class (the second class described below). So we just return one implementation. Method configureInstance() configures the component and, in particular, declares exported service interfaces and the services used. Since an OSGi bundle can implement more than one component, it is good style to check, which component should be configured in line 26. Then we declare the services exported by our component. Recall that in order to receive packet-in events, the component has to implement the service interface IListenDataPacket. Therefore, by specifying that our class PacketHandler implements this interface in line 34, we implicitly register our component as listener for packet-in events. Moreover, we have to give our listener a name (line 31) using the property salListenerName. If you want to understand in detail, what is happening during registration, I recommend to have a look at the method setListenDataPacket() of class org.opendaylight.controller.sal.implementation.internal.DataPacketService. There you will see that so far, packet handlers are called sequentially. There might be many components that have registered for packet-in events, and you cannot force OpenDaylight to call your listener first before another one gets the event. So the order in which listeners are called is basically unspecified. However, you can create dependency lists using the property “salListenerDependency”. Moreover, using the property “salListenerFilter” you can set a org.opendaylight.controller.sal.match.Match object for the listener to filter packets according to header fields. Otherwise, you will receive all packets (if not other listener consumes it before our handler is called; see below). Besides exporting our packet listener implementation, we also use other services. These dependencies are declared in line 37. In our example, we only use one service implementing the IDataPacketService interface. You might say now, “fine, but how do I get the object implementing this service to call it?”. To this end, you define two callback functions as part of your component class (PacketHandler), here called setDataPacketService() and unsetDataPacketService(). These callback functions are called with a reference to the service (see implementation of PacketHandler below). As you can see, our handler implements the listener interface IListenDataPacket. This interface declares the function receiveDataPacket(), which is called with the raw packet after a packet-in event from OpenFlow. In order to parse the raw packet, we use the OpenDaylight Data Packet Service (object dataPacketService). As described for the activator, during the component configuration, we set two callback functions in our packet handler implementation, namely, setDataPacketService() and unsetDataPacketService(). Method setDataPacketService() is called with a reference to the data packet service, which is then used for parsing raw packets. After receiving a raw packet “inPkt”, we call dataPacketService.decodeDataPacket(inPkt) to get a layer 2 frame. Using instanceof, we can check for the class of the returned packet. If it is an Ethernet frame, we go on and get the payload from this frame, which is the layer 3 packet. Again, we check the type, and if it is an IPv4 packet, we dump the destination address. Moreover, the example shows how to determine the node (i.e., switch) that received the packet and connector (i.e., port) on which the packet was received (lines 72 and 75). Finally, we decide whether the packet should be further processed by another handler, or whether we want to consume the packet by returning a corresponding return value. PacketResult.KEEP_PROCESSING says, our handler has processed the packet, but others should also be allowed to do so. PacketResult.CONSUME means, no other handler after us receives the packet anymore (as described above, handlers are sorted in a list and called sequentially). PacketResult.IGNORED says, packet processing should go on since we did not handle the packet. If our POM file and code are correct, this should create the bundle (JAR file) ~/myctrlapp/target/myctrlapp-0.1.jar. Why did we do that? Because these are the two services also implementing a packet listener. For testing, we do want to make sure, they are not getting in our way and consuming packets before we can get them. The given IP is the IP of our controller host. You see that our handler received a packet from both switches with the data path ids 00:00:00:00:00:00:00:01 and 00:00:00:00:00:00:00:02 as well as the ports (1) on which they have been received and the destination IP addresses 10.0.0.2 and 10.0.0.1. So it worked. What I did not show in this tutorial is how to send a packet. If you join me again, you can see that in one of my next tutorials here on this blog. OpenDaylight comes with a set of REST interfaces. For instance, in one of my previous posts, I have introduced OpenDaylight’s REST interface for programming flows. With these interfaces, you can easily outsource your control logic to a remote server other than the server on which the OpenDaylight controller is running. Basically, the controller offers a web service, and the control application invokes this service sending REST requests via HTTP. Although the concept to offer network services as web services is very nice and lowers the barriers to “program” the network significantly, it also brings up security problems well known from web services. If you do not authenticate clients, any client that can send HTTP requests to your controller can control your network — certainly something you want to avoid! Therefore, in this post, I will show how to secure OpenDaylight’s REST interfaces. 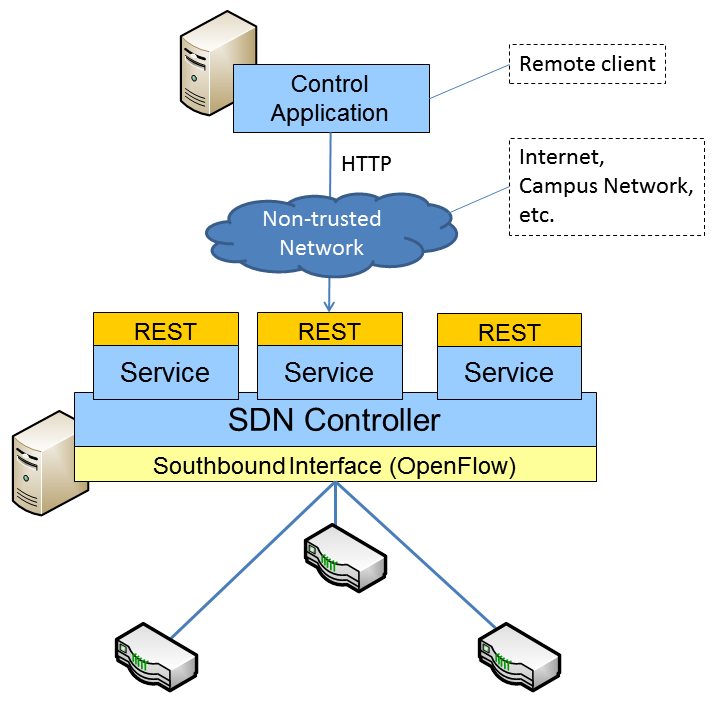 The REST interfaces are so-called northbound interfaces between controller and control application. 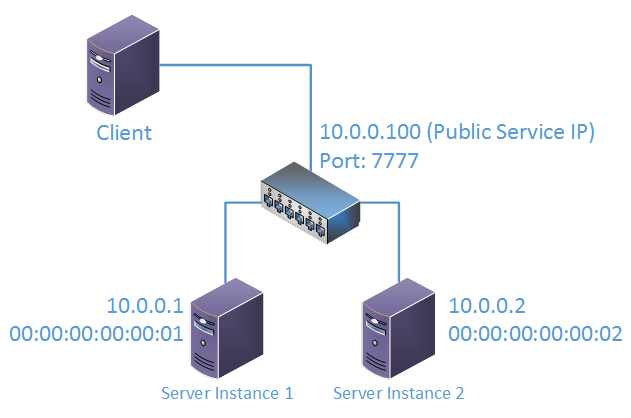 So you can think of the controller as the service and the control application as the client as shown in the figure below. In order to ensure that the controller only accepts requests from authorized clients, clients have to authenticate themselves. OpenDaylight uses HTTP Basic authentication, which is based on user names and passwords (default: admin, admin). Sounds good: So only a client with the valid password can invoke the service … or is there a problem? In order to see the security threats, we have to take a closer look at the HTTP Basic authentication mechanism. The interesting header field is “Authorization” with its value “Basic YWRtaW46YWRtaW4=”. Here, “YWRtaW46YWRtaW4=” is the user name and password sent from the client to the controller. Although this value looks quite cryptic, it is actually plain text. This value is simply the Base64 encoding of the user name and password string “admin:admin”. Base64 is a simple translation of 8 bit characters to 6 bit characters involving no encryption or hashing at all! Basically, it comes from the time when SMTP was restricted to sending 7 bit ASCII characters. Everything else like binary (8 bit) content had to be translated to 7 bit characters first, and exactly that’s the job of Base64 encoding. You can use a paper and pencil to decode it. Just interpret the bit pattern of three 8 bit characters as four 6 bit characters and look-up the values of the 6 bit characters in the Base64 table. Or if you are lazy, just use one of the many Base64 decoders in the WWW. Now the problem should become obvious. If your network between client and controller is non-trusted and an attacker can eavesdrop on the communication channel, he can read your user name and password. Now that we see the problem, also the solution should become obvious. We need a secure channel between client and controller, so an attacker cannot read the header fields of the HTTP request. The HTTPS standard provides exactly that. Moreover, the client can make sure that it really connects to the right controller, and not the controller of an attacker who just wants to intercept our password. So we use HTTPS to encrypt the channel between client and controller and to authenticate the controller, and HTTP Basic authentication to authenticate the client. So the trick is, enabling HTTPS in OpenDaylight, which is turned off by default. Note that above we used the insecure HTTP protocol on port 8080. Now we want to use HTTPS on port 8443 (or 443 if you want to use the official HTTPS port instead of the alternative port). OpenDaylight uses the Tomcat servlet container to provide its web services. Therefore, the steps to enable HTTPS are very similar to configuring Tomcat. Is CN=duerr-mininet.informatik.uni-stuttgart.de, OU=Institute of Parallel and Distributed Systems, O=University of Stuttgart, L=Stuttgart, ST=Baden-Wuerttemberg, C=de correct? This creates a certificate valid for five years (1825 days) and stores it in the keystore .keystore in my home directory /home/duerrfk. As first and last name, we use the DNS name of the machine, the controller is running on. The rest should be pretty obvious. Use the keystore location and password that you used before with the keytool command. Now you can start OpenDaylight and connect via HTTPS to the controller on port 8443. Use your web browser to try it. The PEM certificate is everything between “—–BEGIN CERTIFICATE—–” and “—–END CERTIFICATE—–” (including these two lines), so we can just copy this to a file. Note that you have to make sure that the call is actually going to the right server (not the server of an attacker). So better call it from the machine where your controller is running to avoid a “chicken and egg” problem. Now we can securely outsource our control application to a remote host, for instance, a host in our campus network or a cloud server running in a remote data center.